The following was written by Julius Grafton and was originally publish in the November 2017 issue of CX Magazine. 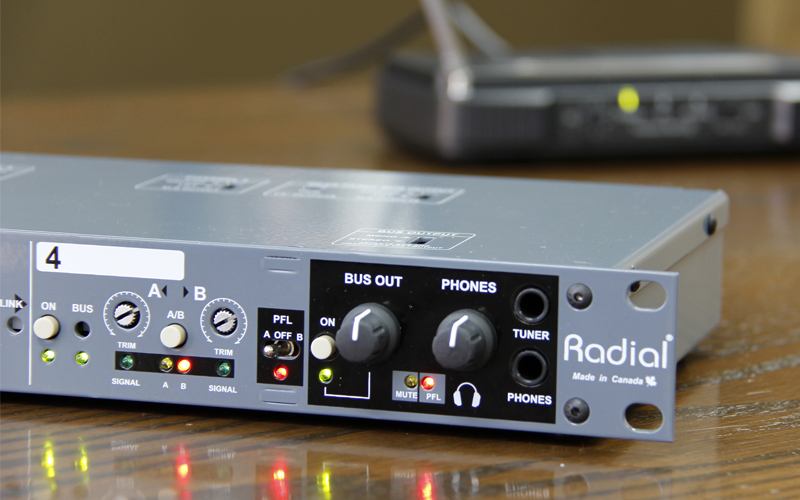 Radial of Canada make a huge range of useful devices, from DI boxes to guitar re-amps. Not only is their stuff well built and tough, but it looks like eye candy too. 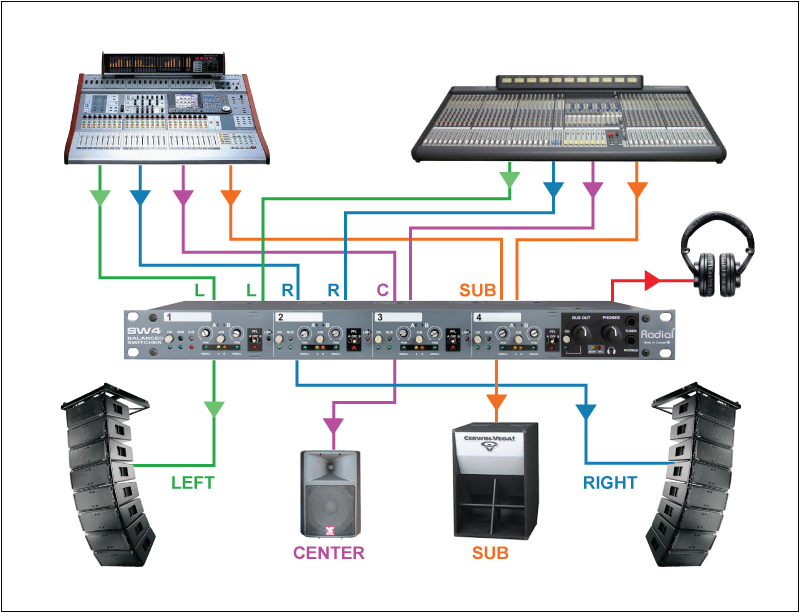 Getting the user interface right along with functionality is an art form that many audio manufacturers struggle with. Enter the SW4™, the box you need when you have two consoles and one PA system. A fairly common occurrence, given most headline bands get to choose what type of console they will use, and often prefer the support band use something else. A lot of venues just have the imported console plug right in to the house console, and if you have the right mindset this can be done digitally. But taking the outputs of a console and plugging them into two input channels on another is a crude approach, inviting overload, latency and noise into your mic. SW4 switches two stereo pairs to one stereo output, with full transformer isolation through each path. It has sealed military grade relays inside for utter dependability. It is quite hefty—due to the transformers inside. The power supply connects with an XLR connector so it can’t worm loose. There is no power switch, it springs to life as soon as the juice is connected. But there are further uses—for example, switching wireless system receivers. Rather than having a backup receiver sitting across a pair of mixer channels, you have it coming in to the SW4. Then if the first system goes bad, you just A-B switch system #2. The downstream users, like monitors and/or broadcast splits probably don’t even know the systems were just switched. 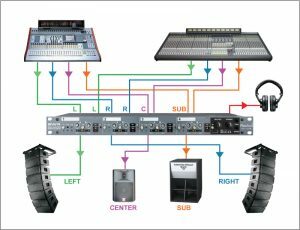 Whereas without this switcher, you’d need to get on comms and tell everyone – with probable downtime playing havoc with the mixes. Switching between backing tracks, and between band and a DJ are other uses. This is handy: each channel on the SW4 is equipped with a 3 position PFL switch (Pre-Fade-Listen) that routes the A or B signals to the headphones and front panel MONO out. Most controls are recessed, Radial have thought long and hard about making the unit “fool resistant”, and frankly I think they’ve done a great job! For more on the Radial SW4. Radial Gear used on all Top Ten Tours This Month!